We’re going to take this in two parts because really it’s a HUGE shift. Appendix A is almost exclusively devoted to this one shift! It’s a pretty big deal. When I first started looking into it…I looked like this guy. 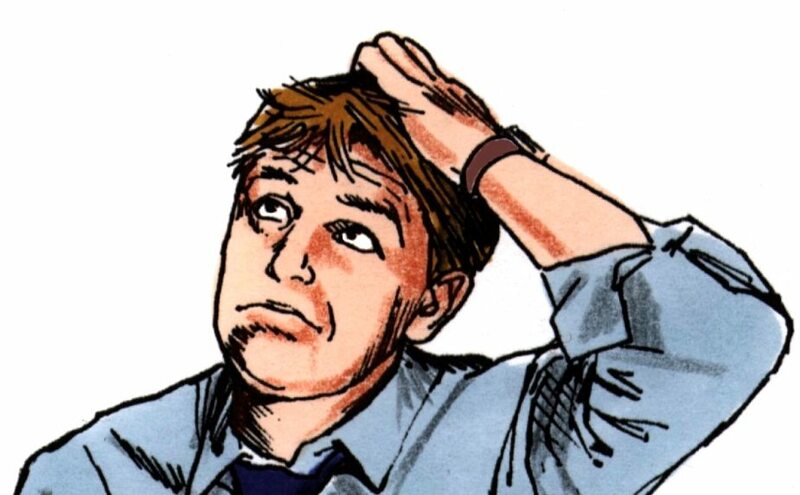 To be honest…after I read the appendix one time through…I was STILL looking like this guy! LOL! Today we are going to look only at how the standards approach text complexity. 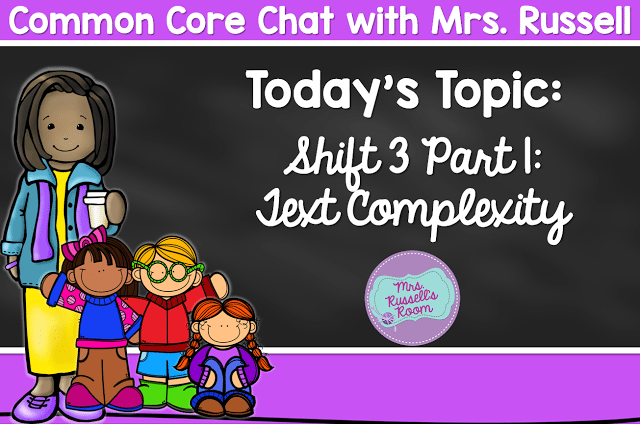 Next week, we will look at what it looks like to implement complex text in our classrooms. Complexity doesn’t only include readability levels like lexiles or AR grade equivalents. The standards were developed in large part as a response to declining student scores in reading and math. We are not able to compete on a global scale as well as we were years ago. Researchers got together with educators and stakeholders–such as people from the science, math, business, and social studies arenas to determine what type of guidelines could be created to help every student get as close as possible to college or career ready by the time they finished high school. The standards are certainly not the end all be all, but they are a guide to MASTERY. When the students have completed the grade level, they should be able to do all of the things set up in the standards–but that’s not ALL they should be able to do. We must stretch them with rigorous text. This refers to what can be more accurately measured by computer software because it would be too difficult or impossible to measure by a reader alone. For an example, word length, word frequency, sentence length…these are all things that can be measured by a lexile score. 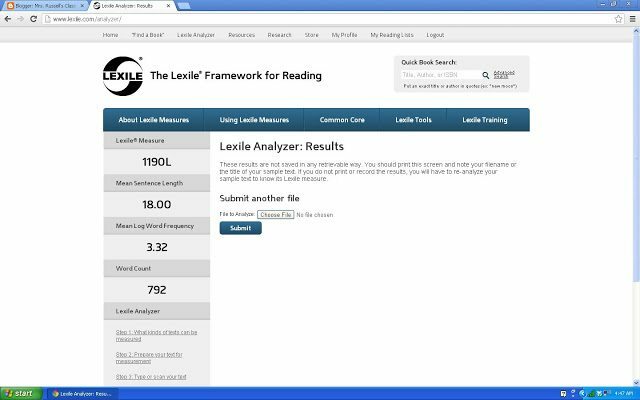 I don’t know if you guys have ever tried it but, Lexile.com has a neat feature where you can level a text according to lexile. They already have many texts in their system, but if you can’t find one, you can just type it up into a .txt file and submit it, (up to 1,000) words. You’ll need to get a free account to do it. 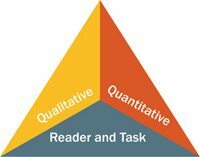 I lexile all of the texts that I write for the students to make sure that the qualitative demands on them are not too terribly high as they are trying to learn something new from it. My first graders would feel that words with 7-8 letters are tough. This blog post’s lexile is 1190. According to the Common Core Complexity bands, that’s about in the 9th or 10th grade expected range for complexity. Kindergarten and First grade lexile bands are subjective to the district or state that you work in…upper grades have bands that can be found on p. 8 of Appendix A in the Common Core Standards. This refers to what the teacher decides is most approachable for his or her learners at specific times of the year. For an example, I may read a book in October with one class, and that same book may not be able to be read to my next class until January, because it may be too much for them. Sometimes, our readers motivation, knowledge, or experiences will prohibit them from being able to embrace the complex text at that time. We know our kids best. We need to scaffold–or break down the information into digestible bites–so that the students are able to take it in, and go forward another step in their learning. These three pieces work in concert to determine text complexity. One can not be used without the other. Oh…and on a side note…kindergarten and first grade students should never be tested on complex text. So, now that we’ve started this dialogue…When we are looking at bringing in complex text to the classroom, what factors determine whether or not a text is complex? What should we look for in a product? What should it contain if we were writing it? Let’s discuss!